*	From Exeter, take the M5/A30 South Bound. *	Take the exit at Whiddon Down. 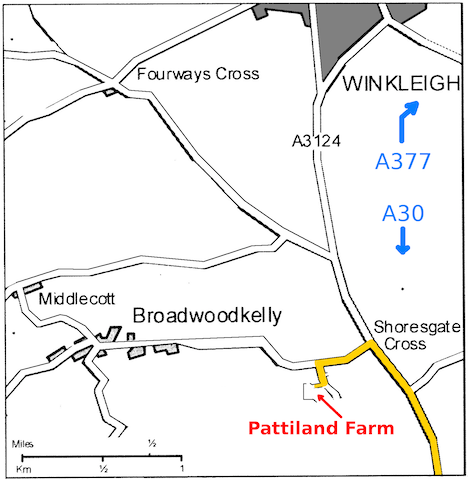 *	Follow the WINKLEIGH signs, and two miles south of Winkleigh take the BROADWOODKELLY turn at Shoresgate Cross. *	Follow the lane SLOWLY for around 350 meters, turn left into Pattiland Farm. *	Follow the driveway past the bungalow, bear around to the right and arrive in the yard of Pattiland Farm, you will be directed where to park.